demolition, robotics, technology, Vancouver B.C. A worker at the remote controls of a Brokk 400d demolition robot on the site of City Hall’s East Wing, March 18, 2017. The demolition of Vancouver City Hall’s East Wing Annex back in March made use of a remotely-controlled demolition robot—the first such instance that I’ve heard of in Vancouver. Today (July 28) a friend forwarded a photo to me which he took of the East Wing demolition work on March 18th. 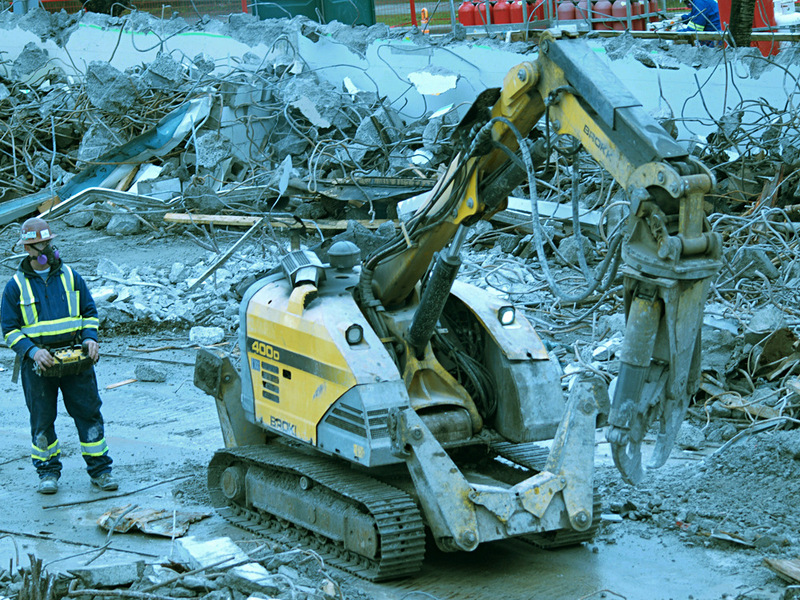 The photo shows a face-masked worker operating the wireless controls of a tractor-treaded machine with the footprint of a mini excavator—a Brokk 400d demolition robot. An ad for Brokk in the June 2013 issue of Access International describes the company’s electric-powered demolition robots as combining “impressive hitting power with an outstanding reach” and so small and light that they can work on weak floors and “take the stairs (or the elevator) between floors”, all while keeping the operator out of harm’s way. The Brokk 400d debuted in 2013. Unlike Brokk’s earlier electric models the 400d is powered by a four-stroke, air-cooled, diesel engine, which gives it phenomenal power but only a top speed of about 3.2 kph. I doubt that the 400d can use elevators, as it weighs 5.500 kg but it can be fitted with heat-resistant hoses and other parts suitable for work in extreme conditions. Digital commands are issued to the 400d through a handheld control box and transmitted either by a cable attached from the box to the robot, or wirelessly via radio. Brokk gives no indication of the wireless reception range, or the level of encryption used in the signal. The City Hall East Wing Annex was torn down because it was found to be at high of collapsing during even a moderate earthquake. Between 2013 and 2014 nearly 400 city staff were moved from the East Wing to the West Wing, a building located on Cambie Street and 10th Avenue, which was found to be almost as prone to collapsing in an earthquake. Unlike the East Wing however, the West Wing, was deemed worthy by the city to receive a seismic upgrade (whenever the money could be found). In a 2013 Vancouver Sun item on the decision to demolish the East Wing, the prospect of asbestos and lead complicating a seismic upgrade of the West Wing was raised by the city’s general manager of real estate and facilities management, Bill Aujla. Nothing, however, was said about the risk of hazardous materials in the East Wing. But there had to be an expectation that the structure, built in 1970, could likewise contain asbestos and lead. The prospect of the East Wing being lousy with toxic and hazardous materials nay have been enough to suggest the use of a remotely-controlled demolition robot. But I would argue that the mere existence of such a tool (assuming that it works) would be enough to invite its use. It’s very hard to disagree with the idea of functional demolition robots (or remotely-operated demolition drones, as it were). No workers should ever be injured in a demolition, if it can be avoided. Removing the need to make room for and to protect an on-board driver allows for a smaller demolition tool, which can be 100 percent focused on the task and which can then work in spaces too constrained and too hazardous for workers operating traditional excavators. Such remotely-controlled tools should make demolitions faster, safer, and much less disruptive to the surrounding area. And it’s no stretch to imagine a near future with Roomba-like autonomous demolition robots which can be dropped on the tops of buildings and then left to slowly and methodically deconstruct them floor-by-floor. Fans of Japanese mecha anime, meanwhile, will see in such demolition robots a logical step toward the future of the Patlabor anime and manga franchise, (of which I have previously written) where giant bipedal construction machines or “labors” are an everyday fact of life. But back to the here-and-now, I cannot say exactly why the Brokk 400d was employed in the demolition of the East Wing Annex. The city has not had a chance to get back to me with an answer to that question or any of the others which I put to it today, including whether the city owns the 400d outright or just rented it by the hour. Check back next week for updates. Click the image to enlarge it. Having been involved in demolition in very hazardous conditions (arsenic and asbestos along with cyanide) I for one welcome these machines. Anything that puts people at less risk is fine with me. This robot also is a descendant of the wheel barrow bomb disposal robot which has prevented a good many more deaths. Not all automation is bad.